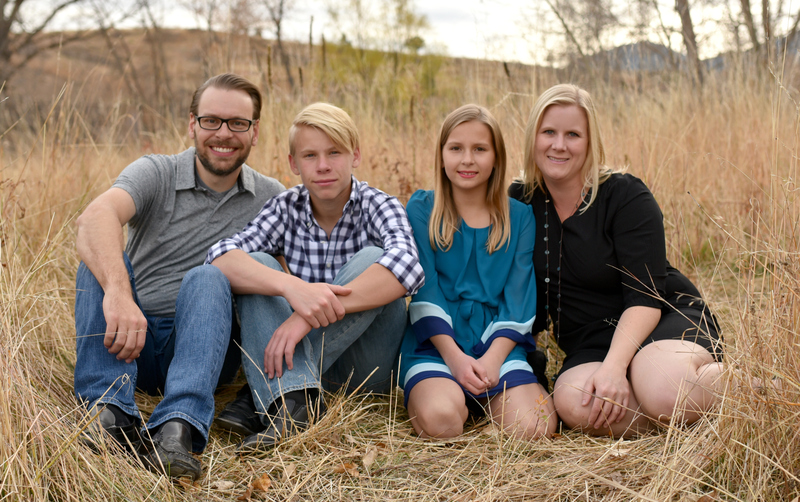 As you probably know, because it’s all I’ve been able to talk about lately, we are wrapping up a big kitchen-turned-half-the-house renovation. 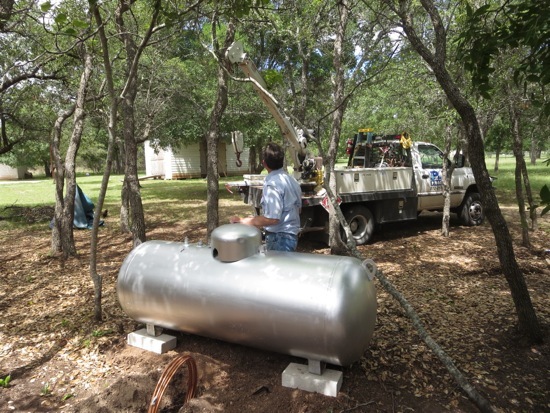 One of the upgrades we did was install a big ol’ propane tank on our property so that we could bring in a gas range instead of the electric one we used to have. I should seriously start a series about the differences between living in the suburbs vs living in the country. I feel like the Beverly Hillbillies out here, but in reverse. We are serious ‘burbs people, and watching us fumble our way through country life has been interesting to say the least. Installing a propane tank falls squarely into this category. I didn’t really know what to expect, all I knew is that I wanted a gas range, and the fine folks at the propane company down the street told me they could hook me up. I blogged about Phase 1 here, so if you want to start from the very beginning go read that post first. There is no way I’d ever DIY this myself because, hello, propane tanks can EXPLODE. If it involves gas, I’m calling the pros. 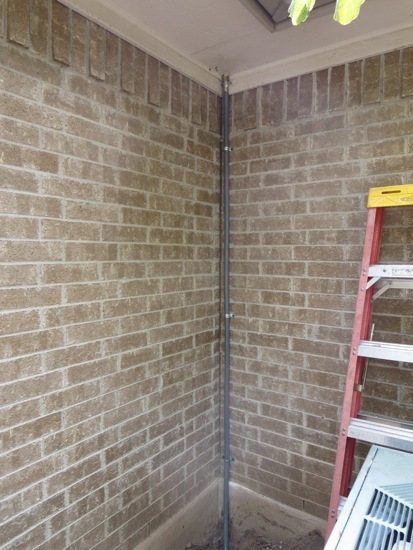 They initially installed all the pipe inside the house, but didn’t finish the work until the renovation was complete and the range was ready to be hooked up. FINALLY it was time to get the blasted kitchen put back together and get the range installed. 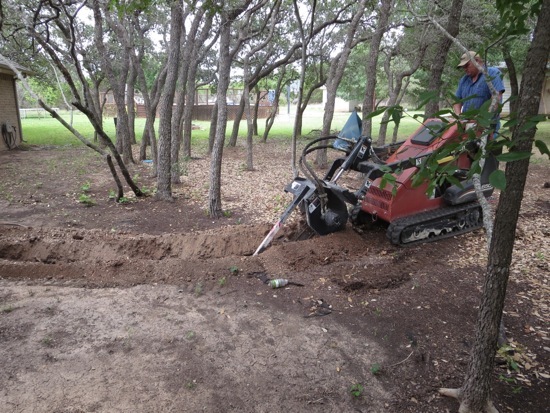 They started by digging a huge trench with a trench winch. I need to rent one of these. 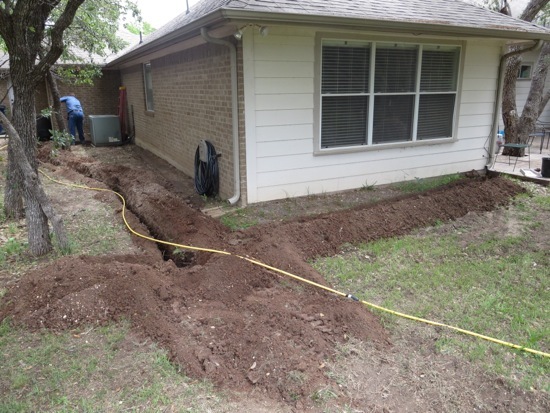 I’m not sure why I need to rent one, but I swear I will find a reason to dig a trench. They wouldn’t let me try theirs out. Just kidding, I didn’t ask. I’m not that annoying. I just watched and drooled and took pictures. It does look hella fun though, doesn’t it?! No? Just me? Never mind then. 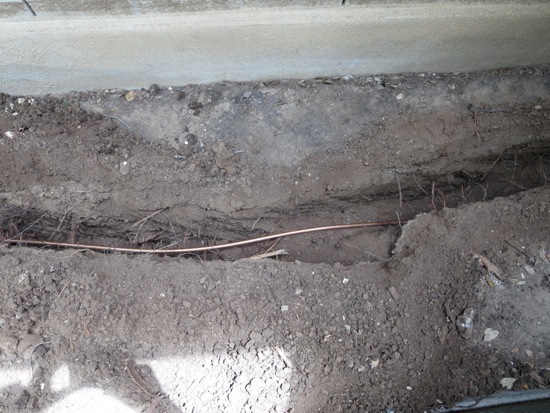 The trench was dug to bury all the copper tubing that takes the gas from the tank into the house. Here’s the tubing they used. They also put some metal tape that looked like that “Do Not Cross Police Tape” into the ditch with the pipe. I asked why and they said so metal detectors can locate the pipe in the future so we don’t accidentally cut into it. Smart. I would have never even thought of that. I guess the tubing they used doesn’t respond to a metal detecter? Well, whatever, I really don’t even care enough to google that right now, so ya, they laid metal tubing and metal tape into the hole. 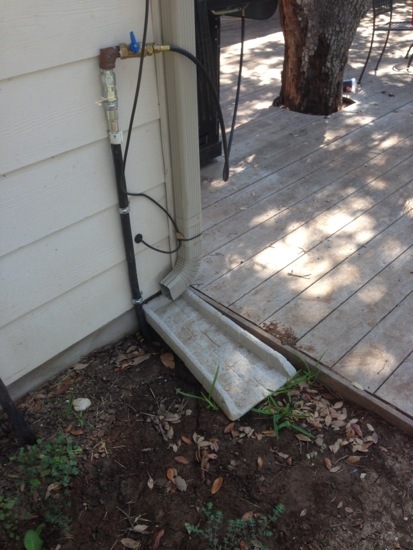 They attached the metal tubing to this flexible tubing running up the side of the house into the attic. That flex tubing running up the side of the house goes into the attic, then drops down the wall and comes out where the range goes. 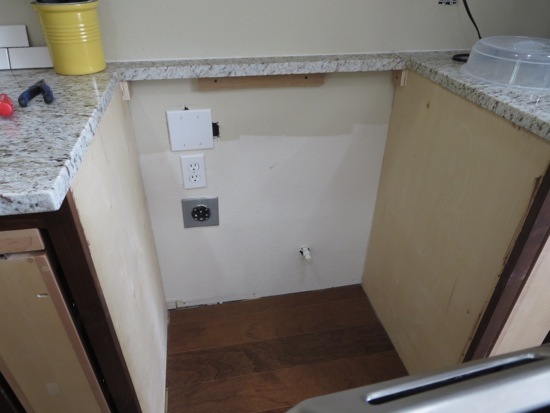 The on/off valve is tucked away behind the right cabinet. You can see a little white knob pocking out of the sheetrock in the bottom right section of wall. That is the gas line. We left the electric line as well, but shut the breaker off permanently. It seemed pointless to take it out. The regular plug outlet was added to plug the range in for the digital panel. Once the trench was done they backed their truck up and plopped the empty tank into place. I may have considered hugging my new tank. That’s how excited I was to be getting a gas range. I really hated that electric one. Sorry to all you electric folks, but I seriously love cooking with gas. 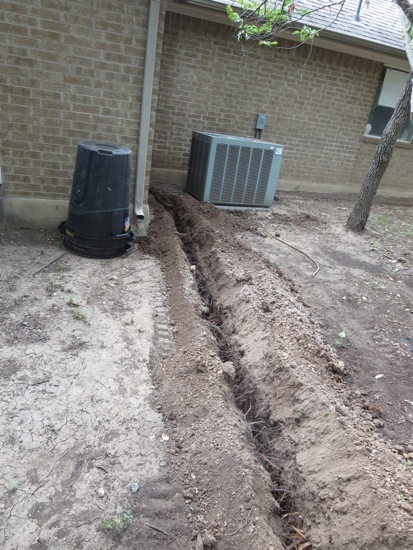 We also had them run an extra line outside to the back of our house for our barbecue grill! We will never have to refill those little propane tanks ever again. That line comes out right at our back deck, and our grill just hooks right into it. There’s an on/off valve there as well so we have to turn the gas on at the valve, then turn the grill on. It’s a GE Profile slide-in range with a double oven. I’m compiling a post right now that goes into more detail about what appliances we purchased and why, so sit tight. But as you can see, it is a gas range. It came prepped for natural gas, so in addition to all the other work the propane company did, they also had to install this beast for us (without scratching our floors! a feat in itself because this beast was freaking heavy) and they had to spend like an hour or more converting it to propane. Who would have thought you’d ever be learning about propane while reading House of Hepworths? We are officially country people now. Oops, gotta run. Time to go out back and start burning a huge pile of brush. Country people love to burn brush! Congratulations on switching to propane for cooking! I have to put on my Home Inspector hat, though, and make one recommendation. The flexible gas pipe appears to be CSST, or Corrugated Stainless Steel Tubing. While this is easy to work with and makes installtion a breeze, it also needs some special attention by an electrician. CSST is vulnerable to pinhole leaks, which can occur with power surges and spikes, like with close lightninbg strikes. CSST should be properly bonded by a licensed Master Electrician to protect your home and family. We have information on our website about CSST and the risks involved with it. Stay safe! Isn’t having the grill outside hooked up to the gas line the best! Love ours and use it constantly, weather permitting. I kind of miss burning brush! That and seeing how any different colored mushroom one could find in the spring. It’s a country treasure hunt! Enjoy the gas, it’s amazing. Haha! I guess I better get scrounging some brush??? Aw man…. you’re making me miss my gas stove. Our new house came with geothermal heating and cooling so no previous owners installed propane like everyone else out here has. It took me a year and a half to relearn cooking on electric, which I grew up with. And the best thing about gas stoves (and fireplaces)? They work when the power is out. Which happens a lot in the country. I HATE my electric stove!!!! I could get gas delivered into my home but it costs approximately $3,000. I have not looked into propane yet. I am hoping we will sell this home and buy another one that has gas in the house already. I wanted to do this the last time we bought a stove and my husband talked me out of it. If we stay, I am getting a gas stove but I truly hope we will be moving. Enjoy your stove. I wanted to send you the above link, in case you decide to paint your propane tank. You can google and see other designs that people have done. I think the watermelon with ladybug is neat. I love that idea. We have a glass top electric stove because our house is all electric. The stove is beautiful, and I have no problem keeping it clean and shiny. BUT it’s electric, and I so wish we had gas. How large is your new tank? We have a small tank for our gas grill and fireplace, but we’d have to have a bigger one if we wanted to power a gas stove. I’ll be keeping this project in mind. Have a great day! 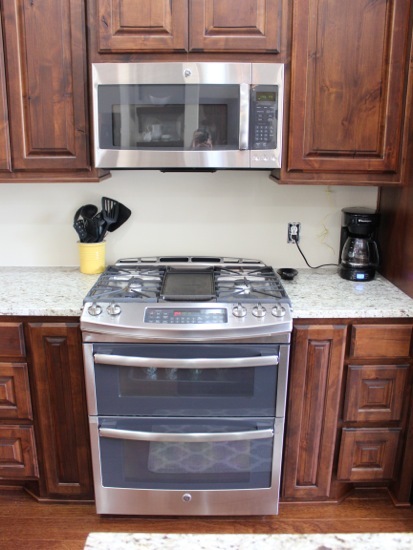 I am pretty sure we just bought that exact stove, I can’t say for certain because we are painting the kitchen and then we have to put down flooring and then we can get our new appliances. I am really excited about getting gas and the double ovens. If we can ever get done with it all…actually I think we never get done but you know what I mean. I would love to rent a ditch witch. That might make for a fun party, everybody can drive it and tear up a garden spot really spectacularly. Your kitchen is so beautiful, congratulations! Wow, that’s really impressive that you installed the tank on your own! It would probably be smart to also start getting propane deliveries. That way, the propane tank is no inconvenience to you at all. I loved reading about the whole installation process! Thanks for sharing! That’s awesome to see that you can install your own propane tank. For some reason, I thought that a private person couldn’t install their own. If I can actually install my own tank, I can save a whole lot of money I think. I am the same as you when it comes to gas and fire safety it is best to call a professional. I also prefer gas to electric, but luckily everywhere I have lived except for one apartment has gas. I like the stove/ oven you installed it looks pretty sleek. Propane tank is a good choice. I also plan to change with this alternative too but still considering every pros and cons of using propane.